Posted on April 17, 2011, in Silent Sunday and tagged Rocket. Bookmark the permalink. 14 Comments. Will do. I planted them this morning. Hope you have boys as i guess they would love to grow a rocket. No kids, this was a gift from a friend. So far so good! Great photo pose. Ooh rocket is one of my absolute favourite salad leaves! Mine too, just hope I grow it successfully. 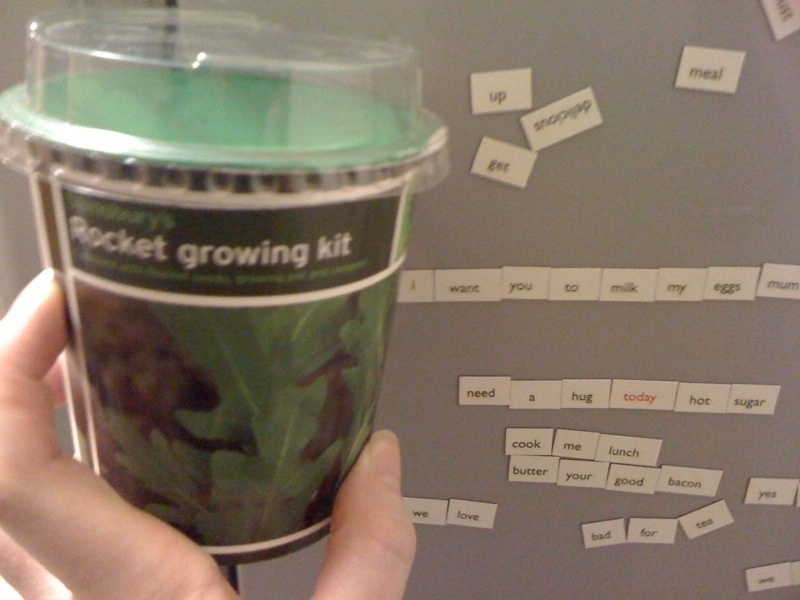 I used to have some of those fridge magnets- love them! Sorry about the delay in approving this – it got spammed. It’s fun making sentences with these random words. ‘I want you to milk my eggs’??!! Sorry, I love looking at backgrounds in photos!! Hee hee I’m still laughing about it now – trying not to wake people up!